When you have a highly successful marketing campaign what should you do? 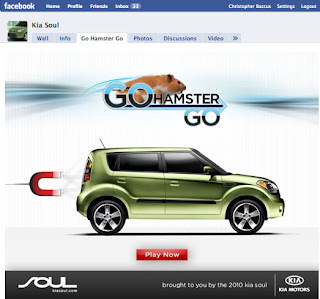 Extend, extend, extend… And this is what Kia is doing with their Soul’s hamster campaign. Their TV spots have been very well received and now they are reaching out into social media with “Go Hamster Go” an online game on Facebook. The game uses augmented reality technology, requiring a webcam. The object is to drop as many hamsters into a Kia Soul as you can in a timed race. You drop each hamster “using the magnet that will appear on your forehead.” Sound odd? Sure but this is a Kia Soul and it’s a bit odd too, but like the car the game is some fun odd. Your image appears in the background as hamsters roll down an assembly belt and you move your head back and forth to snag hamsters and drop them in Kia Souls that appear, each time the color of the Soul changes featuring the different colors the car comes in. Occasionally, a vehicle feature also appears to the side. The game promotes Facebook behaviors like “Challenge a Friend” and “Publish” your score which will also inspire more usage as friends share across their social network. I always like the challenge aspect as it gets others who may not be interested in the brand or product at least interested in beating their friend at a game. The bad part is that there are some barriers to playing. One you need a computer with a webcam and you need to install some software to play, which will cause some drop-off in people playing each other. I sent the game to five friends at work and realized none of them have webcams on their laptops, maybe they can use it at home, if they remember. Overall the execution is well done. The game play is a bit different but that’s part of its appeal. It’s challenging which is a good thing. Most importantly, it extends the already popular hamster idea a bit further while also making the vehicle a prominent part of the game’s engagement.